Sam Moll couldn't bear to watch in the ninth inning as closer Trent Daniel tried to complete the Dust Devils' no-hit bid. The roar of the crowd gave him the good news. Making his sixth professional start, Moll struck out five over five innings and combined with Daniel and two other relievers on the second no-hitter in team history as short-season Tri-City blanked Salem-Keizer, 3-0, on Saturday night at Gesa Stadium. "I started getting antsy [in the ninth inning], I couldn't even watch. I was just standing by the helmet rack, where all I could see was the pitcher," Moll said. "I heard the crowd because it was a 1-2 pitch and it was a dropped third strike and our catcher tagged [Salem-Keizer's Brian Ragira]. I heard the crowd, so I poked my head out." Moll (2-1), the Rockies' third-round pick in last month's Draft, figured a no-hitter was highly unlikely after the Volcanoes erupted for a season-high 17 hits in Friday night's 10-7 triumph. "To be honest, I expected them to get maybe one or two hits -- no disrespect to our pitchers because they're all good," he said. In fact, they were excellent. After Moll lowered his ERA to 2.28, Shane Broyles walked one batter and struck out a pair over two innings, Jerad McCrummen fanned one in a 1-2-3 eighth and Daniel picked up his Northwest League-leading seventh save by sandwiching a hit batter between a fly ball to left field and two strikeouts. 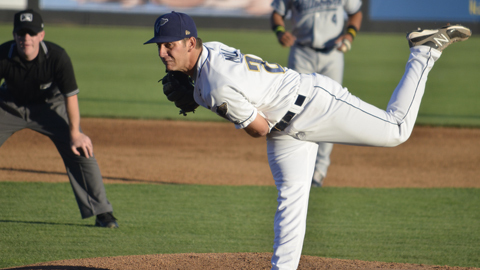 When Ragira struck out, it put the wraps on the Dust Devils' first no-hitter since Kip Bouknight and Pat Lynch combined on a perfect game against Boise on Aug. 8, 2001. "It was exciting. My parents are actually in town for three days, so they got to watch it," said Daniel, who has allowed three hits over 9 2/3 scoreless innings since being selected in the 17th round of the Draft. "It was a good crowd, all around a good game, with good offense, good defense and [Moll] set the tempo for us." Moll appreciated how quickly Daniel closed out the Volcanoes. "[Daniel] did a great job, he didn't make it last too long, so that was definitely a plus. We didn't have to bite our nails the whole time," the University of Memphis product said. The key for Moll was keeping the first-half division champions off-balance by mixing his fastball and changeup against the eight right-handed batters in the lineup. "I threw a lot of changeups and they swung through a lot of them and it really helped me, especially since I could pass that info along to our relievers," Moll said. Daniel, also a lefty, utilized the heads-up he got from Moll to give the Dust Devils reason to celebrate. "It was exciting. My catcher [Chris O'Dowd] kind of picked me up and bounced me around, then the rest of the team came out there," Daniel said. "[Outfielder Wilson] Soriano took my hat from me, so I was hatless walking back. I haven't been a part of that on a field." Dust Devils right fielder Marcos Derkes hit a two-run single in the second and added a double in the seventh, while first baseman Patrick Hutcheson singled twice, stole a base and scored twice. Brandon Simes is a contributor to MiLB.com. This story was not subject to the approval of the National Association of Professional Baseball Leagues or its clubs.